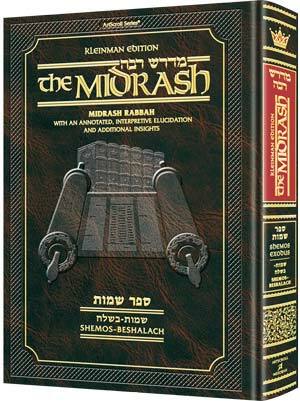 I’m reading the first words of ArtScroll’s newly-released volume of the Kleinman Edition Midrash Rabbah — Parashas Shemos through Parashas Beshalach — and I am puzzled. Why would Chazal start the narrative of Klal Yisrael’s agonizing galus in Egypt, and their wondrous salvation, with a discussion of how a person should discipline his child? I read through the elucidated text, the notes, and the Insights section, and it’s like I’ve been bumping around in a dark room, banging into unknown barriers, and suddenly a light goes on and I can see what everything is, and where everything belongs. That’s the brilliance of the Midrash. And that’s the wonder of this monumental translation and elucidation, which has enabled me to access that brilliance. The Midrash is one of the most important sources we have to understand the spiritual essence of the Torah. It also adds detail and information to the Torah’s narrative, and helps us understand the ethical treasures hidden in the Torah’s words. But the Midrash is often not easy to follow, and its messages are sometimes obscure. If you’ll allow me another metaphor: The Midrash helps us to see the Torah through Chazal’s eyes – and the Kleinman Edition Midrash Rabbah gives us the “glasses” we need to perfect our vision. The parshiyos in this volume take us through the era when Klal Yisrael became a nation, its identity forged both through suffering and miracles. The Midrash adds so much to our understanding. Why should Pharaoh have been punished, if Hashem hardened his heart? What kind of Torah observance did the Jews do before Har Sinai? Why did the future Sin of the Golden Calf actually hasten the redemption? We turn to the Midrash for the answers. The Kleinman Edition Midrash follows ArtScroll/Mesorah’s acclaimed phrase-by-phrase translation and elucidation to make the words of Midrash more easily comprehensible. Explanatory footnotes clarify difficult concepts and passages, and the “Insights” section allows us to see the Midrash through the eyes of major medieval and contemporary giants of Torah thought. It also includes the Hebrew text, newly typeset, and many classic Hebrew commentaries, including Rashi, Matnos Kehunah, Eitz Yosef, and Maharzu, plus the out-of-print classic Eshed HaNechalim. Oh, and the question of why Shemos Rabbah begins with disciplining children? If you want to know the brilliant answer – just open the newest volume of The Kleinman Edition Midrash Rabbah.